One of my favorite meals is Orzo Stuffed Peppers. We make stuffed peppers frequently in the summer because we can find the most beautiful sweet bell peppers at the farmers market for super cheap. The other day peppers were on sale so we decided to bring a little summer sunshine to our cold winter day by making orzo stuffed peppers for dinner. We use yellow, orange, or red peppers and stuff them with orzo, spinach, tomatoes, garlic, onion, basil, and cheese. We like to use mozzarella cheese and Pecorino Romano. We put a little in the mix and sprinkle some on top of the peppers when they are almost finished baking. Stuffed peppers can be served as a side dish or main dish. We usually serve our stuffed peppers with a side salad and call it good. They are pretty filling. I try to not eat the entire pepper so I can have leftovers, but I am always licking my plate clean.I can’t help it, they are too tasty! If you are looking for a new dinner idea, try Orzo Stuffed Peppers. 2. In a medium skillet, heat the olive oil over medium heat. Add the onion and cook until tender, about 3 minutes. Add the garlic and cook for two more minutes. Stir in the spinach. Cook until spinach is wilted. Remove from heat. 3. 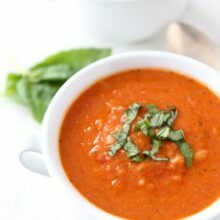 Pour the tomatoes into a large bowl and stir in the spinach mixture. Set aside. 4. Meanwhile, bring the vegetable broth to a boil in a medium saucepan. Add the orzo and cook for five minutes. The orzo should be only partially cooked because it will finish cooking in the oven. Strain the orzo pasta, making sure you save the vegetable broth. 5. Stir the orzo into the tomato spinach mixture. Stir in the cheese and season with salt and pepper. Stir in the basil. 6. Pour the vegetable broth into a 3-quart baking dish. Slice the tops off the peppers and remove all ribs and seeds. Cut a very thin slice from the base so the peppers will stand up in the baking dish. 7. Place the peppers in the baking dish and spoon the orzo mixture into the peppers. Cover the dish with foil and bake for 40- 45 minutes. Remove the foil, sprinkle the top of each pepper with additional cheese and continue baking until the cheese is golden, about 15 minutes. 8. Remove from the oven and let peppers sit for five minutes. Serve warm. Those look sooo good! I love orzo but dont ever make it. Your post reminds me how much I need to make it. Great recipe! That stuffing is wonderful! Orzo is a fabulous ingredient. We love orzo and I love that melted cheese on top. These look so delish Maria! I never really had stuffed peppers growing up, but I really enjoy them now. I can’t wait to try this version! What a beautiful and delicious sounding vegetarian meal! A great idea for Meatless Mondays or any day of the week. I love stuffed peppers with orzo. The tiny pasta keeps the dish light which I love! Great recipe! 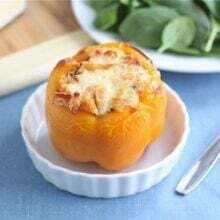 I love making stuffed peppers with different types of pastas and grains – and that melted cheese on top looks killer! I can’t wait for pepper season around here. wow that looks FABULOUS and its so pretty! xo great post girl! I love stuffed peppers and don’t enjoy them often enough – you’re right about making them in the summer with fresh peppers – can’t wait! Those look so delicious! I definitely need to try this! This is one of my favorite dinners in the summer when I have more bell peppers in the garden than I know what to do with! It’s a great way to use ’em up! Can’t wait to try your version come July! 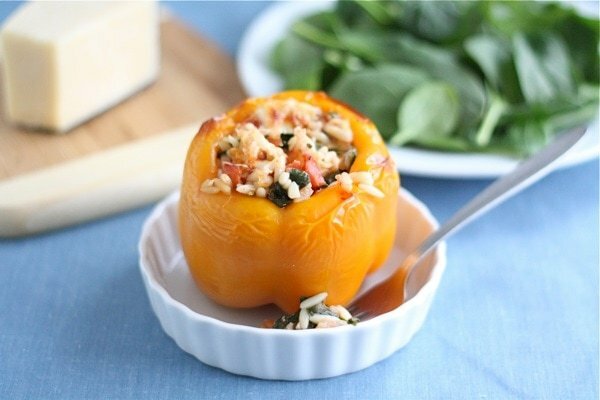 At the moment, I can’t think of anything better than peppers stuffed with orzo! I too, love a good stuffed pepper in the summer. Love the orzo idea! These look so great! I’ve always loved stuffed peppers. And the orzo and cheese is perfect!! I love orzo stuffed peppers – love the pictures! I’ve got to try these! I love stuffed peppers. I usually go for the beef or lentil variety but now I have a new option. Your recipe sounds so good! Stuffed peppers remind me of summer—love this! Stuffed peppers are a wonderful creative outlet aren’t they? They’re as much fun to play with as mac and cheese and soup. Love this version. I love orzo and I can’t resist all of that cheesy goodness. These look delicious! I’m adding this recipe to my meal plan next week. Thanks! I’m happy to have a new idea for dinner. This is perfect for me with a big green salad. I need these in my life today, looks great Maria! You’re right about tasting the summer! These look so inviting – might have to try them soon!! Thanks! I live in the Cayman Islands were its perpetual summer and I happened to pick up some lovely peppers at the farmers market this week. Thanks for giving me a tasty looking recipe to try tonight! I love orzo; never thought of using it for stuffed peppers! Sounds yum! I love stuffed peppers – my mom always made them with rice. I am going to try orzo for sure though! These look so pretty and healthy and perfect for warm spring weather! I love stuffed pepper, but like the twist by using orzo. I will definitely be trying this soon! I would certainly not be able to control myself around these peppers! The whole one would go straight into my belly all too quickly. Especially with a filling like that! We adore stuffed peppers, but sometimes get tired of the rice-stuffed versions. Stuffing them with orzo is a really nice change. I’ve got a box of orzo just sitting in the pantry and this recipe sounds like the perfect way to use it up! I’ve never even had orzo before. I’ll had to give it a try in these peppers! These look absolutely delicious. My mom made us stuffed peppers all the time growing up! But never with orzo, I’m definitely going to give these a try! Love Love Love Stuffed Peppers! Beautiful Maria! I make stuffed peppers all the time in the summer too! I love the yellow ones! These look so flavorful and delicious! Yum!! Gorgeous Maria! This is such a great dish. 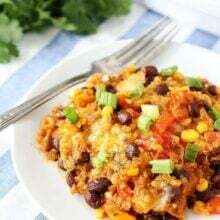 Lovely combination of flavors and a perfect meatless meal and one that even my carnivorous clan would eat!! These look delicious. I grew up on stuffed peppers…LOVE them. This recipe looks so healthy and delicious. I’m going to have to make this for me and my daughter soon (my hubby doesn’t like peppers…but I bet he’d like what’s in ’em!). I just made orzo stuffed peppers too and loved how they reminded me of summer – yours look fabulous! I enjoy these in the summer time as well and I always love the vibrant colors of the peppers. The slightly browned cheese on top looks inviting too! These look delightful, Maria. I love peppers, and stuffing them with orzo just makes them seem all the more inviting. I love all the ingredients of the stuffing, the orzo, the spinach the tomatoes and of course the cheese! I could eat this every day. The pictures are gorgeous! and these peppers looks delicious, the filling having such a great combination of flavours! This pepper recipe looks so tasty. I love orzo, and am excited to pair it with peppers! Love orzo and Israeli couscous too interchangeably. Stuffed bell peppers many times with rice but never with orzo. Dish looks fresh and healthy!! btw stumbled you! Looks amazing Maria. I love love love orzo! These look lovely! I always get so many bell peppers from our CSA during the summer, so I will save this recipe so that I know what to make when I start to run out of ideas for all of those peppers! Such a bright, cheery summer dish. Lovely. Yum! I love stuffed peppers. Looks great. oh these look amazing. I’m going to have to try this, I wonder if my husband would eat it?? Thanks for sharing the recipe my frnd! I love stuffed peppers, but honestly always forget about them! This looks good. My grandma used to cook alot with orzo when we were kids – it brings back memories! I love stuffed peppers, but I’ve never done them with orzo. Definitely something I will have to try next time peppers are on sale here! Love orzo and great idea to stuff in into a pepper. It’s so pretty! I needed one more dinner for my menu this week, when I remember you made this one. I think I’m going to try it. It looks delicious. I hope you like the stuffed peppers! This looks great Maria! Stuffing peppers is something I always forget to do. It’s a dinner that I really like, especially with that yummy filling! Thanks for the wonderful recipe! I made them last night and my husband and kids gobbled them up!! I’m making these tonight but substituting the orzo for brown rice (couldn’t find any in the supermarket!). How do these store for re-heating/how would you re-heat them? I’m planning on having them as leftovers later in the week. You can reheat in the microwave or cover with foil and heat in the oven at 350. 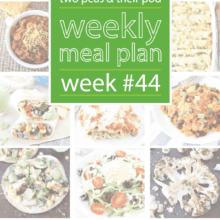 PS – Switched the Orzo to Quinoa and hoping for the best! Thanks for the great recipe! It was light and delicious–perfect for a summer dinner. I love your recipe and make these all the time. I make mine Greek style. I use a package of feta cheese, zest of one lemon, juice of one lemon and crushed tomatoes instead of diced. I find the filling freezes well, so I make a double-batch of it and freeze half. These are not “your mother’s” stuffed peppers.